On Sunday, August 29th in the very warm school gymnasium 525-575 people enjoyed the popular Christian Group Tenth Avenue North. It was a spirited crowd including people who came from two hours away to enjoy the band's music. The concert was put on by the Union Church of La Harpe with the help of a number of local sponsors. Lead singer Michael Donehey kept the crowd entertained with his energetic vocals and penetrating challenges to truly and fully embrace the love of Christ. He said the band does not play FOR Christ, they play BECAUSE of Christ. 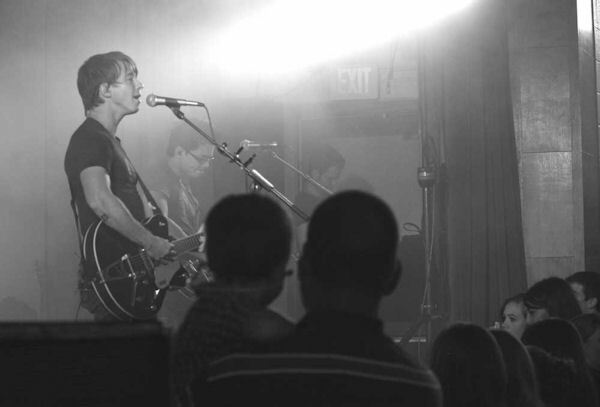 The band's songs challenge Christians to rest in God's grace and then seriously follow Him. Donehey encouraged the crowd to sing, dance, and enjoy the evening. Even with the heat everyone had a great time. The concert was the final highlight for those who were involved with the band throughout the day. John R. Louden III (the Union Church concert organizer) met the band at the school at 9:00 a.m. Some of the band cleaned up at a local home and then had a light lunch at the Union Church of La Harpe put together by Maggie Goettsche and Lynne Beaver. Equipment for the band was unloaded at 1:00 p.m. and there was a 20+ teens and adults there to lend a hand. The regular youth group members of the Union Church and Christian Church were invited to the sound check. During the long sound check the group was entertained by Donehey's recitation of famous movie lines. Following the sound check, group leader Donehey watched a dance from Paige Olin which was set to one of the Bands' songs. Craig Corzatt (using Donehey's guitar) sang the songwriter one of his original songs and then Donehey posed for pictures. The band adjourned for showers and some rest and then had dinner at the home of Steve, Lynne and Chris Beaver. Following the concert the band took showers, had some more food and headed back to their bus around 11:15. The bus pulled out of La Harpe shortly after midnight. For Louden and several others, it was a long day but a good one. Tenth Avenue North's first CD "Over and Underneath" is approaching 400,000 in sales. Their brand new CD released in May is already approaching 90,000 copies. All their songs are available on iTunes. The Union Church is grateful to the community for its support and looks forward to future concerts. . . when the temperature is cooler.